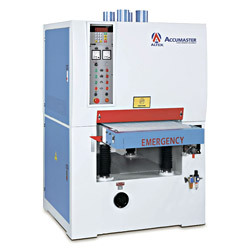 Accumaster Machinery Industries Co., Ltd.
1. Automatic Wide Belt Sander - available for each kind of board polishing. 2. Automatic Wide Belt Planer Sander - available for heavy cutting of composer, jointed panels and solid wood. 3. Automatic Wide Belt Sealer Sander - available for lacquered panels sanding (generally used for board polishing after painting). 4. Specifications: 600mm, 915mm, 1100mm and 1300mm. 5. Combination Head: single belt, two belts and three belts. 6. Model: economic model, standard model and heavy-duty model. 7. We have so many types and categories. Besides the standard specifications, we have some special outfit available for clients' production requirements. We'll provide you with appropriate models and specifications, and continue researching and developing in order to satisfy clients' demands. 1. Working width (inch/mm): 43 / 1100. 2. Working thickness (inch/mm): 5 / 127. 3. Main motor STD/MAX (HP): 20, 15. 4. Feed motor (HP): 3. 5. Hoist motor (HP): 1 / 2. 6. Sanding belt size (inch): 43 x 75. 7. Feed speed (m/min): 4-16. 8. Net weight (kg): 3000. 9. Gross weight (kg): 3500. 10. Packing size (LxWxH) (inch): 76x82x83.